NMSU celebrates reading and literacy in the borderland with its common read of Luis Urrea's novel Into the Beautiful North. Hailed by National Public Radio as a "literary badass" and "master storyteller with a rock and roll heart," Luis Alberto Urrea is the award-winning, bestselling author of numerous books of fiction, poetry, and creative nonfiction and a member of the Latino Literature Hall of Fame. Raised in Tijuana and San Diego by a Mexican father and American mother, Urrea inherited a rich legacy of cultural lore and a love of storytelling from his extended family on both sides of the border, though he claims he’s “more interested in bridges” than borders. In his third novel, Into the Beautiful North, an idealistic 19-year-old woman is inspired by the film The Magnificent Seven to travel from her home in Mexico to the United States to enlist seven men who’ve left her town to return and help protect it from drug-dealing bandidos. It’s a “wonderful comic satire,” writes The Denver Post. “Urrea uses a breathtaking Mexican magical realism to construct a shimmering portrait of the United States.” "No great adventure is told without great characters, and Urrea certainly knows how to create them…. That Urrea has turned a usually disturbing subject into a book that keeps a smile on your face is a tribute to his storytelling" (Miami Herald). "They kept veering north, as if there would be some magical gap in the fences. As if there would be some way into the USA that nobody had ever tried, or that the Border Patrol had overlooked." Into the Beautiful North is a quest novel in the grand tradition, though there are no medieval knights, magic rings, or lightsabers within its pages. Author Luis Alberto Urrea sets the novel in the present day, in the highly charged world of the U.S.-Mexico border region. Nayeli, an energetic and idealistic girl of nineteen, is coming of age in a Mexican village, more than 1,000 miles from the border. She and her friends spend their days working at low-wage jobs and surfing the Internet for videos of their favorite bands and movie stars, dreaming of a wider world they have little hope of knowing. They live in Tres Camarones (Three Shrimps), a village where folks like things to stay the same. But change is coming fast. Nayeli’s Aunt Irma has just been elected the first female Municipal President of the village. Nearly all of the men of the village, including Nayeli’s father, have gone north to the U.S. to find work, and drug-dealing thugs have recently begun to target the village, anxious to profit from drug-buying American surfers who frequent the nearby beaches. One night, Nayeli and her friends attend a screening of John Sturges’s classic film, The Magnificent Seven. In the film, a Mexican farming village is terrorized by a bandit until the village elders decide to fight back, electing three farmers to travel to the U.S. to find seven brave gunfighters to help defend the village. Inspired, Nayeli vows to go on a mission to the U.S. to bring back seven men—including her father—to defend Tres Camarones against the drug-dealing bandidos. She persuades her loyal band of friends to accompany her on the dangerous journey, and the quest begins. 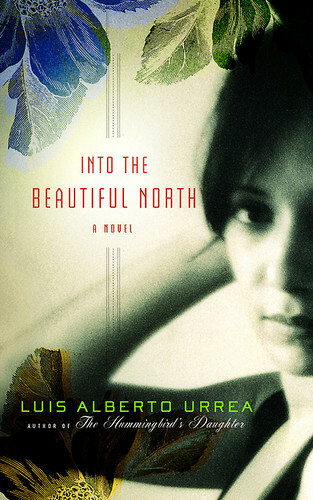 In Urrea’s border world, characters come into contact with tensions that arise from many kinds of difference. Urrea explores, with compassion and humor, the microcultures within the border world, from the residents of the Tijuana garbage dump to the upscale neighborhoods of San Diego, and reveals that the distance between them is not as great as one might initially imagine. Lacking influence, money, or power, Nayeli, and her friends, employ ingenuity, youthfulness, and hope to overcome obstacles, suggesting that a new generation can bring new solutions to old problems. Urrea cleverly subverts cultural stereotypes and literary traditions, creating a fresh approach to the classic hero’s journey. Athletic, bright, strong-willed, and charmingly naïve, Nayeli is admired by loyal friends who, like her, are just out of high school, but share a bleak future in the poor Mexican village of Tres Camarones. She identifies with her Aunt Irma, a charismatic feminist, former bowling champion, and newly-elected Municipal President of Tres Camarones. Yolo, short for Yoloxochitl, a name bestowed by her liberal Mexican parents to honor her Aztec heritage, was a straight-A student in high school "simmering with revolutionary ideas." Yolo works a dead-end job at the local bowling alley, but reads everything she can. Veronica, known as Vampi, is the only goth girl in the state of Sinaloa. Her look is distinctive: black hair dyed even blacker, pale makeup, black lips and nails, and a long black skirt. Despite her appearance, Vampi’s experience with goth culture is limited, derived from YouTube where she worships bands such as The 69 Eyes and Type O Negative. Tacho is the gay proprietor and cook of the village restaurant, La Mano Caída (The Fallen Hand), a frequent hangout for Nayeli and her girlfriends. Tacho and Nayeli are kindred spirits, both dreaming of a cosmopolitan life in a big city. They sometimes climb up on the roof of the restaurant to look at the sky, "making believe that clouds were the Manhattan skyline." A young missionary once stationed in Tres Camarones, Matt is the first "real live blond boy" Nayeli and her friends have ever seen. After his return to San Diego, Matt lives aimlessly, until he receives a phone call from Nayeli and the true extent of his generosity is revealed. Raised in the dumps of Tijuana and armed with a bamboo rod, Atómico brings his unique sense of justice to the journey. His scrappy and maniacal exterior hides a mixture of pride, loyalty, and humble nobility.